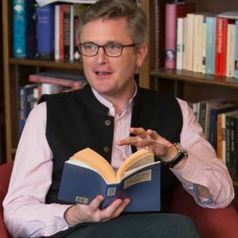 Peter D. McDonald is Professor of English and Related Literature at the University of Oxford and a Fellow of St Hugh’s College. He writes on literature, the modern state and the freedom of expression; the history of writing systems, cultural institutions and publishing; multilingualism, translation and interculturality; and on the promise of creative criticism. His principal publications include British Literary Culture and Publishing Practice, 1880-1914 (Cambridge, 1997), Making Meaning: ‘Printers of the Mind’ and Other Essays by D F McKenzie, co-edited with Michael Suarez (University of Massachusetts Press, 2002), The Literature Police: Apartheid Censorship and its Cultural Consequences (Oxford, 2009; see also theliteraturepolice.com), and Artefacts of Writing: Ideas of the State and Communities of Letters from Matthew Arnold to Xu Bing(Oxford, 2017; see also artefactsofwriting.com). He is currently part of a research team working on PEN and the freedom of expression (see writersandfreeexpression.com).